Recently, Coastal Custom Wine Cellars completed the construction of a residential storage room in Los Angeles, California. The structure had many interesting features, and among them were the wine racks and shelves that were made from Redwood. 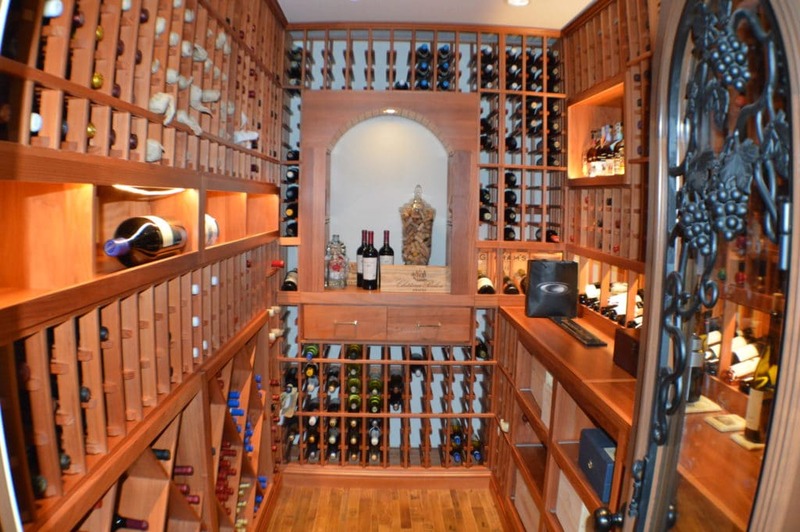 Beautiful storage room built by Coastal Custom Wine Cellars in a home in Los Angeles, California. There are various kinds of wood used for building wine cellars and racks. Among the most popular choices are Mahogany, Pine, Walnut, Redwood, and Sapele. The type of wood species used in the construction of the storage room contributes not only to the durability of the structure, but also to the overall design and aesthetics of the room. 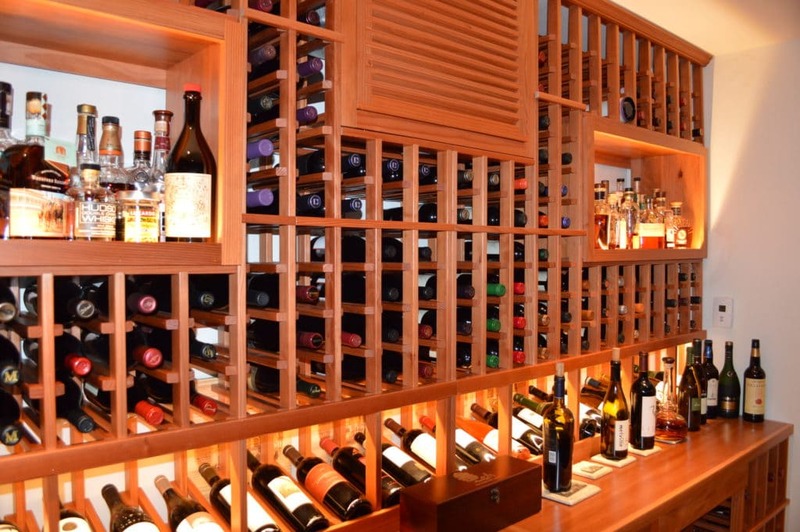 Learn about the most popular kinds of wood materials used for building custom wine racks! Click here! The client in the Los Angeles residential wine cellar project decided, together with the contractor, to use Redwood for the racking and the shelves. Redwood is a high quality kind of wood that has natural oils preserved in it. These oils make the material highly resistant to moisture and mildew. A lot of people choose to use Redwood also because of its aesthetic qualities, such as its soft earth tone color distinctions that develop over time. Some people opt to keep Redwood unfinished or unstained, which is alright because the material is gorgeous even without any finishes or stains. But the client in this project wanted the wood to have a lacquer finish. There are various types of finishes (e.g. polyurethane, varnish, shellac, and lacquer) on the market, but not all wood species are compatible with all of these finishes. It is important to consult with a wine cellar expert regarding the most appropriate kind of finish for any wooden rack. Redwood was used to build the wine racks and wooden storage cases. The material was then lacquer finished to enhance its colors. The team of wine storage experts from Coastal applied lacquer on the residential cellar’s wooden racking and shelves. Lacquer is a brilliant choice of finish for Redwood, because it gives the material an intense gloss. A lot of people like using lacquer because it is very durable. The Los Angeles home wine cellar looked more vibrant after the application of lacquer because the color of the Redwood became bolder and more pronounced. The client was very happy with the effect. Need a professional to apply a finish on your wooden wine racks? Find a trusted expert today! Click here! One of the reasons why this project was successful is the open communication between the client and the contractor. It wasn’t just the team from Coastal deciding on the design and structure of the cellar. The client was contributing a lot of ideas too. For example, the client suggested that his wood case shelves should be installed on commercial rollers. The builders did as requested, which made the storage boxes easily accessible to the client because he does not need to bend down to take wine from the shelves. He simply pulls the case out by sliding them across the rollers. LED lights were installed across the display row, and this made the wine cellar look more extravagant. Wood cases are sold in various sizes on the market. Depending on the requirements, there are shelves that can accommodate a number of bottles. Some boxes can store three to six bottles. In the Los Angeles home cellar, the wooden cases were custom designed so that the openings in every box were adequately large to store bottles of various sizes, including Oregon Pinots, Shiraz, Turley Zinfandels, and standard champagne bottles. The builders added a display row in one of the shelves, and it was lined with LED lighting. Besides accentuating the overall design of the wine cellar, the display row also acts as an efficient bottle management tool. Like wines can be stored above and below the display row. The wine room originally had a mini cellar where the client could store around fifty bottles of whites and champagnes. The mini cellar was intended for storing bottles that needed to be kept cooler than other wines. The client gave the mini cellar away as a gift, and he now has an empty space in his storage room. The team of contractors from Coastal came back to fill the vacant area by building more single bottle storage racks. 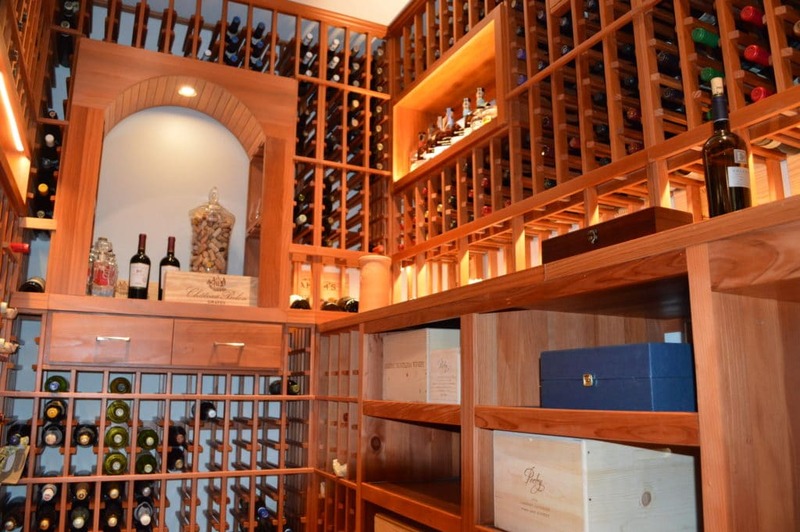 Want to have your own home wine cellar built? Contact an expert builder now! Click here! A louvered grill was built to conceal the mechanical-looking evaporating unit. All wine storage structures need to have a cooling system installed. Without a dependable refrigeration unit, a cellar cannot provide the right temperature and humidity for keeping wines safe from spoilage. Wine rooms vary in storage requirements, and thus, they also differ in the cooling units that they need. The appropriate HVAC system for a cellar depends on various factors, including the number of wines stored, the size of the storage room, the climate of the area, etc. A cooling specialist has to be consulted in order to determine the most suitable refrigeration equipment for a wine cellar. 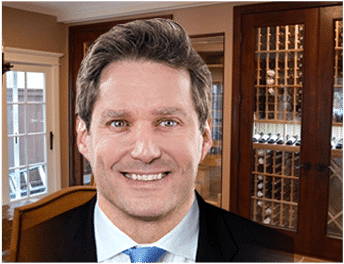 For the Los Angeles residential wine cellar, a team of expert technicians from Arctic Metalworks installed a ductless split type refrigeration system. The evaporator of the cooling system was mounted on the wall of the wine cellar, while the condensing unit was placed outdoors. The split system setup is great because no hot air is being exhausted inside the house. Moreover, the fan coil is operating quietly in the wine room, because the condenser is located away from the cellar. To conceal the HVAC equipment from view, the builders made a grill box for it. A wooden louvered grill, made from the same material as the racking, was created to cover the refrigeration unit. 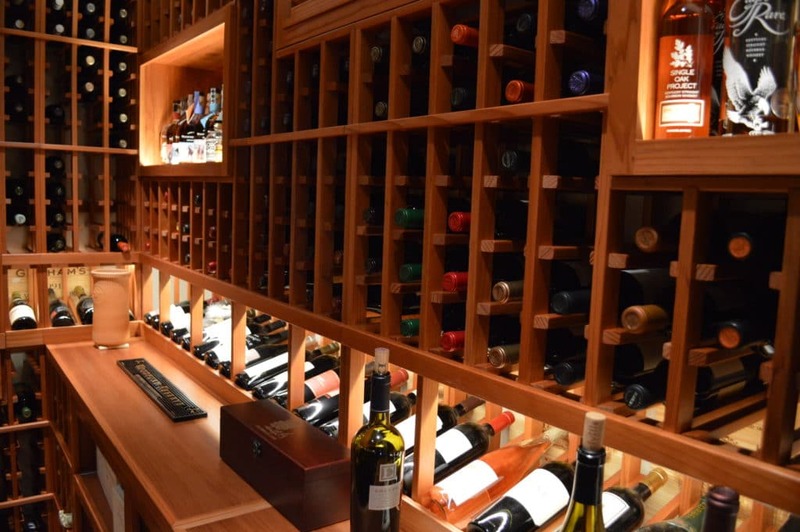 Find out which cooling system is most appropriate for your custom wine cellar! Consult an HVAC specialist today! Click here!